Don't judge us, but... We're currently wearing Santa hats. Okay, we're not gonna lie - it's nearly two months until Christmas Day, but we're already listening to Mariah Carey on repeat. 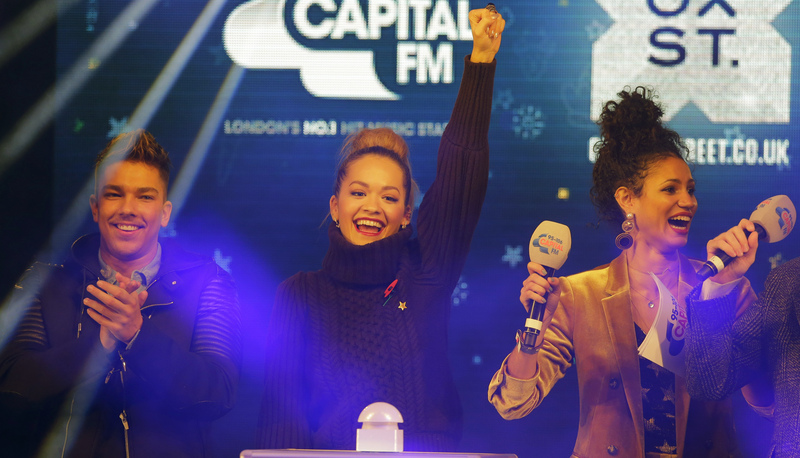 And it's all thanks to Rita Ora, Roman Kemp and Vick Hope, who turned on Oxford Street's Christmas Lights on Thursday, 8 September. > WATCH: Rita Ora Rings Up A Pub And... Throws A Sickie For A Job She Doesn't Even Have?! Partnering up with NSPCC's Light Up Christmas for Children campaign, the trio were joined by thousands of you waiting to see the 750,000 bright lights make London shine. Oh. And you thought that was all? We couldn't give you just the one Christmas present, could we? The likes of 5 After Midnight and Matt Terry performed on-stage to get the festive spirit pumping. > Download Our App Now... It's The Best Christmas Present You're Gonna Get This Year! Matt was joined by Montana from 'Love Island' who helped celebrate his success by handing him a disc commemorating the amount of copies of 'Súbeme la Radio' sold. Not a bad start to Christmas, eh? Speaking of Matt Terry, have you heard he's collaborating with Dua Lipa?! YAAAAAS!